SEPE – Help you to search residential property by area in Singapore based on type of area you are looking for and budget you have. So you're moving to Singapore! It can be a difficult to make that initial decision on which residential area to live in - particularly if your knowledge of the city is limited. At Singapore Expat Property Expats we will help you find the area that's perfect for you. Obviously we will start by looking at the factors and requirements that will help narrow down your options. The type of property you are after and the budget range. If you have children then the proximity of your home to schools will be a consideration, as is the journey to your place of work. The area's proximity to leisure, sport and entertainment facilities is another consideration...And what about the dog, where's the best area for his long walks?! Perhaps it's important to be a short walk from local grocery stores for any forgotten ingredients if you enjoy cooking, or for those not so talented it's being near to cheap but tasty hawker centres! 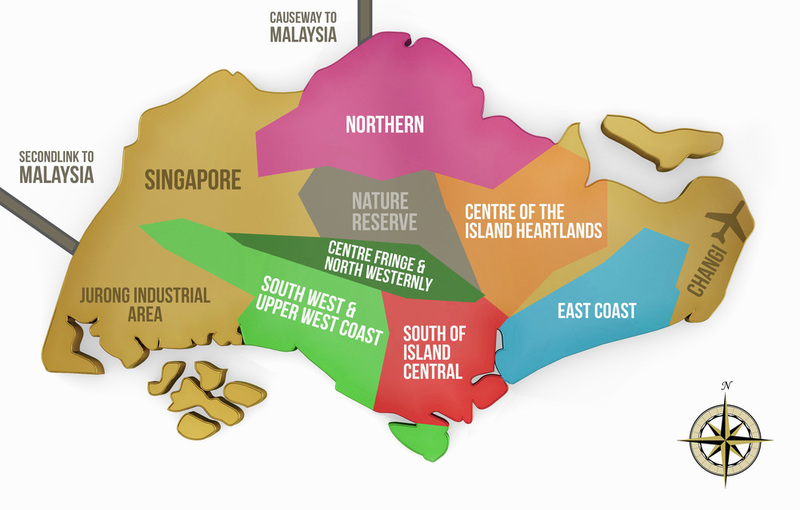 We have broken Singapore down into the MAIN & SUB residential areas below. By clicking on the region below (color-coded with regional map) we will give you some valuable insight into the various residential areas which should help you to narrow down your list before you arrive. Once in Singapore it's time to explore.